Nintendo’s been catering to fans of tactics pretty generously over the last few years. Fire Emblem on 3DS, Fire Emblem on mobile, soon-to-be Fire Emblem on Switch — you can’t really complain. That is, unless you remember their other turn and grid-based strategy game. Back on the GBA and DS, you could get your fix with Advance Wars, and the game didn’t disappoint. It’s laid dormant for about a decade now, but in its wake Chucklefish has decided to strike with their own creation by giving the world Wargroove. Wearing its inspiration proudly, the game sets out to not only do what Advance Wars has done before, but push the genre both in terms of gameplay and presentation. With plenty of maps, multiplayer, and more in its playbook, the game represents the best kind of revival — one that not only lives up to its predecessors, but gives way to new kinds of fun and thinking. For the first time since 2008, I’m glad Nintendo’s seemingly abandoned the Wars series, because in its absence we’ve gotten this well put together gem. 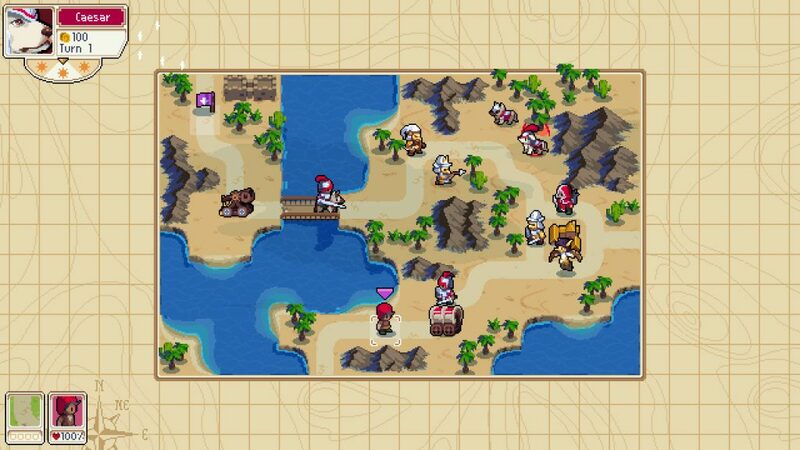 Wargroove will be most familiar to anyone who put time into Advance Wars or any of its followups from the GBA and DS days. Grid-based maps will offer up objectives for you to complete, requiring you to survey your surroundings and both develop and direct different troop types to accomplish goals. More often than not, your win conditions are to take out either your opponent’s stationary stronghold or their commander, their key unit wielding bolstered power and defenses as well as their own, unique abilities. Thankfully, you have a commander of your own to use, able to bring their own special powers called Grooves to the battlefield. These commanders are one of the biggest departures from Advance Wars, for even if you can liken them and their Grooves to COs and their powers, their place as controllable characters gives your army an anchor and their own, individual strategies. Commanders like Mercia and Emeric, the Campaign’s main character and her advisor, work best when they’re placed at the heart of their forces — this makes the most of their healing and shielding Grooves, respectively. Others are more suited to serving as front or back liners for the same reasoning, and there’s some great variety when it comes to modes where you can choose your character freely. It takes more than a leader to win a war though, and Wargroove makes the most of its setting and HD sprite work to give some life and appeal to its nameless legions of loyal soldiers. There’s no modern military aesthetic here, but instead medieval stylings that replace things like tanks and anti-air cannons with functionally familiar knights and mages. 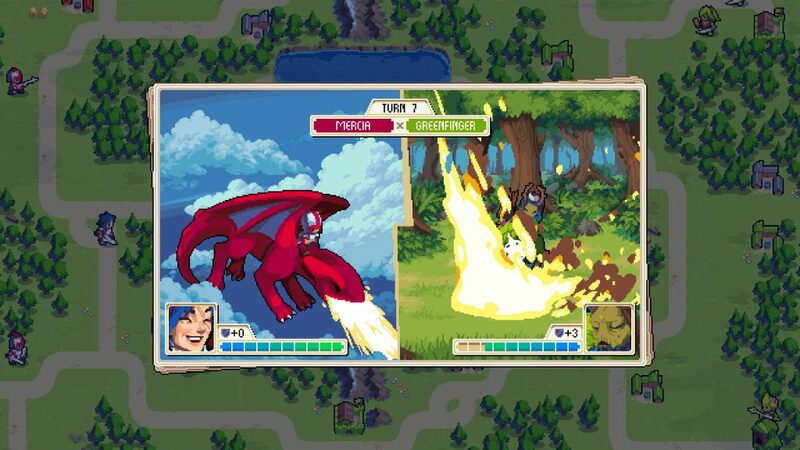 Wargroove also works with its own creative spins, like replacing recon units with loyal (and adorable) dogs to scout ahead, and it eventually gives you control of fantastic beasts, like large sea turtles and dragons. Each faction has its own flavor, with two taking inspiration from European and Eastern cultures and the other two getting a little more mythical with the likes of the undead and a race of plant people. This variety spices things up and makes meeting each of these countries and their commanders a treat. 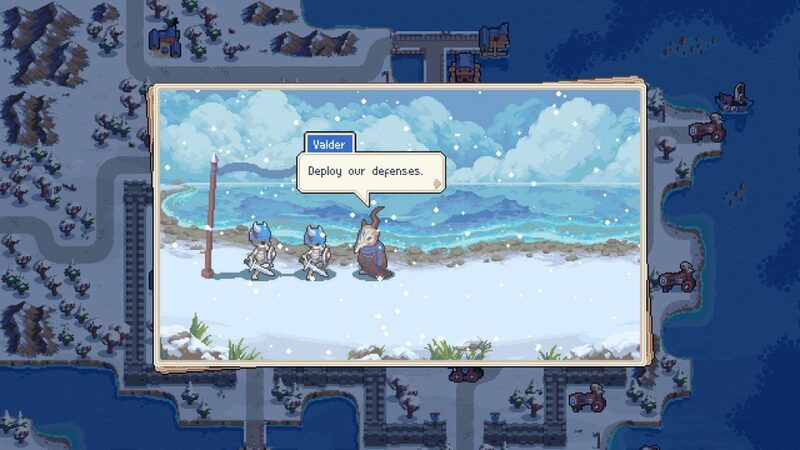 Theming isn’t the only way that Wargroove marches to its own drum, as it makes gameplay choices that encourage things like more strategic troop placements while eliminating more tedious elements like fuel and ammo management. Critical hits stand out as a great addition, letting you get more damage out of your troops if you play or position them properly. Archers get more damage if they forgo moving on your turn, while spearmen get a boost from fighting next to other spearmen. It’s simple enough to plan a few moves at a time, but it’ll take understanding the game’s terrain types, movement and attack ranges, weather, and other fine points to really utilize the system efficiently and effectively. Every unit has its own way to bring out its full strength; and when this understanding clicks, the number of tactical advantages (and potential disadvantages) on the battlefield grow. This neurologic nirvana stands as a capstone to Wargroove’s lengthy story mode and carries over to all of its other modes. Everything gained and experienced helped with multiplayer matches, and made the rest of the game’s content more rewarding. The sheer number of modes and options at your disposal in Wargroove are notable, making an already methodical game that much more massive. There’s the already mentioned Campaign mode, where you’ll play through a story and get to meet all the game’s Commanders. The mode does a commendable job of introducing mechanics, unit types, and situations to you as you go. There’s also Arcade mode, a looser series of skirmishes than the narrative-driven Campaign. Lastly in single-player is Puzzle, presenting tricky arrangements of troops that test you to clear a task in a single turn. I especially enjoyed Puzzle mode, as a common issue with games like this is just how long some maps can take to clear. 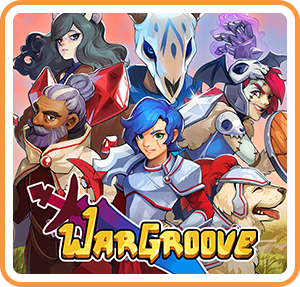 Even with all its charm and innovation, Wargroove can’t escape that inherent quality, giving Puzzle a unique appeal for anyone who wants to pick up the game for shorter periods of gameplay or for those who would like to warm up before taking on a map. You do have to put some time into unlocking this mode though. The same goes for adding more playable characters to Arcade mode, though if you’re the really impatient type, this game isn’t exactly for you in the first place. Multiplayer is easy to dive into as well, allowing up to four players to face off. It’s here that the game really shines on Switch, as on certain maps visibility can be limited to conceal your actions. By playing in handheld and passing a system around it keeps that element of surprise and tactical confusion intact. Online play is also supported, both for similar competitive means but also to make the most of Wargroove’s final piece. 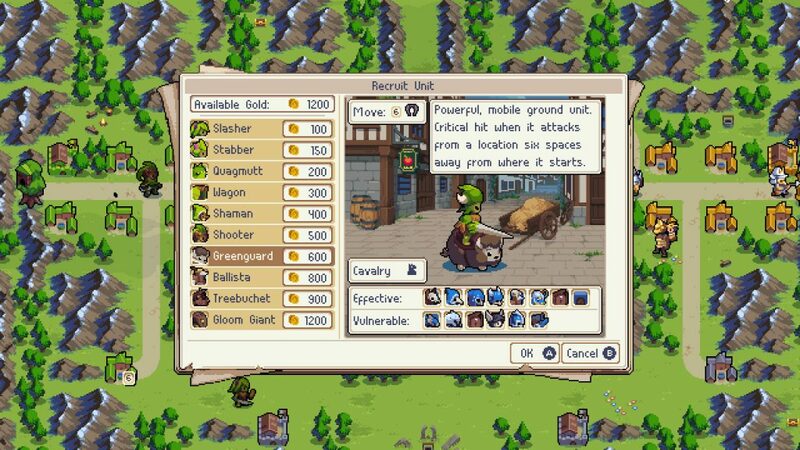 Perhaps for some, the most significant and appealing part of Wargroove is going to be its customization features. The game offers a full map editor, allowing you to tailor-make your own situations. The creator is intuitive and user-friendly by and large, as without any real explanation or instruction it was easy to figure out how to place units or map elements, swap around their allegiance, add new factions, and plenty more. If you dream up a situation, Wargroove gives you the means to not only realize it, but share it with others online. You can even create whole scenarios, linking maps together and peppering in cutscenes and unlockable routes based on your performance. As deep and enjoyable as the gameplay is with Wargroove, perhaps my biggest praise goes to the accessibility and polish. The game offers multiple languages for its text, colorblind consideration, the already mentioned intuitiveness of its customization, and all of this with crisp and charming presentation. Also, as previously mentioned, sprites are gorgeous in motion, pushing a familiar genre and style to a new standard visually. Each faction even receives different versions of its unit types, adding variety to the battlefield — and the UI is fairly unobtrusive while offering all pertinent information with a mere button press. Wargroove is a game that left me barely anything to complain about. It offers up everything I expected from a game inspired heavily by Advance Wars, plenty of its own sparks of brilliance, and a presentation that made even the longest of conquests easy on the eyes and ears. Fans of strategy games better plan carefully, because they’re about to put plenty of time and thought into one of the first undeniably great games on Switch in 2019.